Companies in New York City NYC are always looking for the best 3D rendering design & graphic design idea when it comes to branding. This is essential if a business is going to stand out in markets that are often flooded with options. Companies that do not make an impression are not going to survive. We also provide a wide range of indoor and outdoor large format printing services. It does not matter if you are located in Buffalo, Rochester, Yonkers, Syracuse, Albany or New York City itself – consumers in New York have a ton of choices, so your branding needs to be as powerful and effective as it can be. We can get a 3D rendering design or a print creative graphic design done in matter of days for clients in New York City. Here at Capital Exhibits, we want to help you craft an interior or exterior 3d rendering design on a new product, house, brand that draws attention and becomes a national symbol. We know the ins and outs of this business, including how brand recognition is tied to logos, color schemes and other aspects of graphic design. If you want people to recognize your company in NYC at a glance, simply give us a call and we can start making it happen. We know that small companies trying to grow often do not have that much money that they can just throw at packaging, logos and other aspects of branding, so we always try to keep our prices low. Whether you want to learn more about logo design prices, print design pricing or what it would cost to get started on some brochure design work, we are confident that our prices cannot be beat. This in no way detracts from the quality of the work that you get. We work harder than the competition at every stage. Other professional 3D rendering design companies in NYC & graphic design firms in NYC may need to inflate their prices and over-charge customers, but we are dedicated to providing the highest quality at the lowest possible prices. We are passionate about what we do and incredibly hard working. You’ll also find that we’re incredibly versatile. Take a look at our flyer design portfolio, and then look at the work that the banner design artists have done. These are very different fields with their own requirements, but you’ll see that we hit both out of the park. 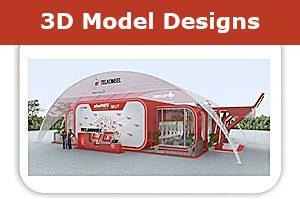 We can work on trade show graphic design projects, business cards, logos for car banners, website design and much more. You name it, and we can do it. This flexibility means that we can take on the entire project from beginning to end so that there is consistency and excellence the entire way. 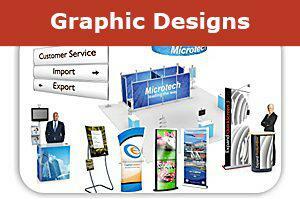 For all of your business graphic design needs, we hope that you’ll choose Capital Exhibits. Do not let your company falter or even go under because you cannot stand out enough to attract customers in New York. Instead, let us help you brand yourself for success, putting you in a position to break into any niche market and start finding the customers that you know your products and services deserve.